The universe is best seen as constructed from thought (or ideas) rather than from substance. "Empty space" is not empty. Beliefs about who one is and what is real form oneself and one's realities. Peptides manufactured in the brain can cause a bodily reaction to an emotion. In the narrative segments of the movie, Marlee Matlin portrays Amanda, a deaf photographer who acts as the viewer's avatar as she experiences her life from startlingly new and different perspectives. In the documentary segments of the film, interviewees discuss the roots and meaning of Amanda's experiences. The comments focus primarily on a single theme: We create our own reality. The director, William Arntz, has described What the Bleep as a movie for the "metaphysical left". 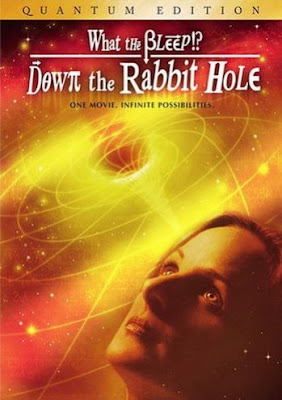 Amanda, a divorced photographer, finds herself in a fantastic Alice-in-Wonderland experience when her daily, uninspired life literally begins to unravel, revealing the cellular, molecular and even quantum worlds which lie beneath. Guided by a Greek Chorus of leading scientists and mystics, she finds that if reality itself is not questionable, her notion of it certainly is. Stunning special effects plunge you into a world where quantum uncertainty is demonstrated - where Amanda's neurological processes, and perceptual shifts are engaged and lived - where everything is alive, and reality is changed by every thought. This film gives voice to the modern day radical souls of science, making them the true heroes of our day as they conquer and map the greatest uncharted territory yet - man's consciousness itself. Very deep. I can't wait to watch this. It's something you have to watch many times and the more you watch it. The more the ideas register with you. I think that everyone sees What The Bleep the movie in a different way. We always want to understand things because it gives us security. At the end of the day though we know very little about a lot of things.